We’re going to China! Last month I was looking up airfare to random cities (like you do) and found tickets to China that were the same price as tickets to Hawaii. Paul’s brother and his family are living outside Shanghai and we’ve been looking for an excuse to go for a while now. We bought the tickets on the spot and now I’m planning a trip (with kids!) to China. If you’ve been I would love recommendations on places to go and what parts of the country to visit. I love remote and beautiful places (even if you have to travel a little farther off the beaten path.) Any suggestions appreciated! We went with a guesthouse group on a bus, but with kids it might be worth it to just hire a driver. It is not off the beaten path, but if you go to Beijing and you go to the Great wall, I recommend going to the Mutianyu entrance. It has a ski lift to take you up and a toboggan to bring you down which the kids will enjoy. It is also a bit less crowded than Badaling. Hong Kong is also an amazing place if you decide to go South instead of North from Shanghai! Oh that is so amazing! I am actually in the process of planning a trip to Italy with my sister and Dad that was a bit of a spur of the moment thing, too. Can’t give you any pointers for China, but I am sure you are going to have a wonderful time! Italy! So exciting!! You’ll have a blast. I’m so thrilled for you! China is great, but I’m also a little biased. Last summer, I took a few friends on a day trip to Beijing before we had to be in Hong Kong for school, and we had the best time booking through http://www.tour-beijing.com. They set us up with a driver, english-speaking tour guide, and really catered the day to our needs. We hit up Tiananmen Square, the Forbidden City, the Summer Palace and Mutianyu Great Wall (definitely go there) all in one day. Our tour guide Coco was amazing, so be sure to request her if you go. And if you’re looking for something a little off the beaten path, you should travel to Hunan and visit the Zhangjiajie mountains of “Avatar” fame. Really breathtaking stuff. I’ve never been to China, so I can’t offer up any advice or recommendations; but I can say that I am SO excited to hear about your trip when you get back! It is a place I’ve always wanted to experience. When do you leave? I studied abroad in Shanghai, and neighboring cities like Suzhou and Hangzhou are peaceful. You can haggle for boat rides; West Lake is very famous is Hangzhou, In Shanghai, I highly recommend Yuyuan Garden. It’s very touristy (crowded), but there are lots of little boutiques and a beautiful garden; I think kids will love this place. I lived in Hunan province (teaching English at a university). I would also suggest Guilin and Yangshou like Cindy said and one of our very favorite excursions was to Zhiangjiajie. Completely biased here as I am native to the city but Hong Kong is a lot of fun! You can get by with English very comfortably, and the culture there is really unique as it’s been very influenced by it’s british ties. Great shopping, AMAZING food. Lots of really great museums and art galleries as well. Stay in the Sheung Wan area if you can, it’s close (walking distance) to Central and Soho but a bit quieter and has some lovely stores that are very in line with your aesthetics. When you see pictures of HK you usually just see big skyscrapers and malls but it’s a very beautiful city in the natural sense as well. Lots of mountains to go hiking on, beautiful beaches, take the kids to Ocean Park! Always a lot of fun. The Hong Kong Disneyland isn’t really comparable to LA in my opinion but since your kiddos are young they’d still have fun. Take the ferry out to Lamma Island and take the hike across the island, it’s really beautiful and there are some really fun tucked away shops. There are also these seafood restaurants with huge tanks of live seafood and you can pick what you want and have them cook it anyway you’d like! And try the street food – the pan fried onion cake is incredible!! Hooray! Congrats! And best of all, no pirates! Also, the street food is awesome, try the pan fried onion cake. The outdoor markets are fun to browse around. You will never see such a variety of eggs in your life! In Beijing–you must check out the dirt market–if it even exists anymore. Amazing antiques and cool art. The Yunnan province was my favorite and Kunming (city of eternal spring) was beautiful but above all–Lijiang is stunning. There are many minority tribes in Yunnan and their textiles are colorful and beautiful. Also–hand pulled noodles in soup are so stinking good. Get some good dumplings! Oh, we just went in October to adopt our daughter… we visited 3 cities: Beijing, Nanning and Gaungzhou…. Guangzhou…. this was a great city and very touristy – you must visit the Safari Park (not the same as the zoo) – it was amazing!!!!! And it took us all day, so well worth the price – make sure you ride the tram first once inside the gate and if you like anything in the shops, get it when you see it b/c they dont have the same stuff… free kiddie carnival rides, and you can feed the giraffes and elephants and see the pandas… very cool! Also, this is the place to do the shopping! If you want to go shopping, look up Ann from Red Threads – she took us around to get what we wanted (so we werent wandering aimlessly) – she took us to where the best deals were (watched them string the pearls I picked out) and her price was almost nothing – so worth it instead of wandering around…. we also just loved walking around Guanzhou – and seeing daily life – that was fascinating and wonderful! China is amazing… but do be aware of foods – most hotels have hotpots, so we took instant grits and oatmeal and that was a lifesaver when we were homesick – wish we would have brought some of those easy mac cups too because mac and cheese is non existent over there and sometimes you just need comfort foods…. bread and peanut butter can be found at the grocery though so easy enough to get those… also, be aware that you cannot drink the water from the tap unless its been boiled (even to wash your teeth or such)…. If you can make it there, Yellow Mountain (Huangshan) in southern Anhui province, west of Shanghai. An incredible experience. Pictures don’t do it justice. I am curious where you did your search for the flights (departing airport, arriving airport, travelocity, expedia, etc.)? Just last night my husband and I were talking about taking a trip to China. Haven’t found anything less than $1100/ticket. We live in Sacramento, so we fly out of here or Bay Area airports. Any info would be great. Excited to see your recap once you get back. We found them on China air (through Kayak). Direct from SFO to Shanghai. $600! You need a vid right? No one ever mentions it, but I was curious what your turn around time on that was. Hey there Jordan! I don’t normally post links in comment sections but I have two recommendations for you that are specific to traveling to China with kids. Hope they help! Jillian, who wrote them, lives in Italy and travels all the time with her kids. We went to china several years ago for a family wedding and visited Zhangjiajie which is China’s first national park. It was breathtaking and full of great activities (hiking, trams etc). We took something like 1300 steps to the top of one of the peaks. Each step was stone and hand laid and all the railing was crafted and painted to look like tree branches (it was actually formed concrete). It was a seriously impressive amount of work and basically on the scale of Yellowstone. At the time (2004?) it was not westernized at all. We were the only Americans or Europeans we saw throughout that entire part of the trip. I’m saying this because the food was good but definitely authentic and not for the feint of heart. Same with the accommodations. Everything about the area was perfectly safe though and I saw lots of Asian families having a great time. Highly recommend it! My wife and I love reading your blog (especially your travel posts) and we are excited about your family trip to China. Having visited China before, I definitely recommend you and your family wear some kind of protection against the smog/pollution. My company recently developed an alternative to the ugly face mask. It is called Scough – the germ and pollution filtering scarf. You can find more information on our website http://wearascough.com/ . We look forward to hearing about your travels. I have NO IDEA where to go in China, but I’m sure Joke of Tokketok has some suggestions since she’s been living in/near Shanghai for a little while now. Sally Shim is also great for travel places in Asia. 1. Jiu Zhai Gou. Fly into Chengdu. Eat the amazing food. See pandas. and then take a plane to this beyond gorgeous site. it will take your breath away. don’t do tour buses. hike both routes. 2. Hang Zhou – So scenic and beautiful. 3. XinJiang – the best fruits and meat come from this part of China. Great mix of cultures and ethnicities. 4. Inner mongolia used to be much more authentic with the mongolian huts you can visit- they kill a sheep for you and you have the traditional ceremony with singers and lots of traditional booze. could be still good if you can find a good spot. the grasslands are beautiful. And in Beijing. you have to do Duck De Chine. Get some Chuar. Stay at the Opposite House for the location, or the Conrad. for Authentic experiences – go to the beijing zoo – but not the actual zoo part. underground there is the biggest clothing market- where the buyers go to get super cheap and great clothing, shoes, accessories. Congrats! You will love China! I live in Taiwan now but spent several weeks in China in college a few years ago. If you have the time and really want to go off the beaten path & see “old China”, I cannot recommend enough traveling to China’s most southern province,Yunnan. The food is incredible and the sights are like nothing you’ve ever seen. You can easily fly from Shanghai to Kunming and from there visit the Stone Forest (magical for kids!) and travel out into the countryside to see the terraced rice fields. Then you can take a short flight to the edge of the Himalayas to Lijiang, which is hands down the most incredible place I’ve ever visited! You can stay in the ancient town and spend your time shopping for handmade treasures, drinking tea on the river that flows through town, hiking to see the mountain lakes, riding yaks and soaking up the traditional culture. Can’t wait to see your pics! Have a great trip! I’ve been keeping up with your blog for years. I’ve used so many of your great ideas, I’d love to help you out with a quick tip! I went to China a couple of years ago and my favorite part of the trip was actually staying in Wuzhen, the “water village.” It’s pretty close to Shanghai if you are planning on stopping there. In Wuzhen, I stayed in a hostel called the Wuzhen Guest House (No.137 Xizha Street, Wu Town, Tongxiang 314501, China). Don’t let the idea of a hostel scare you away. It was beautiful and there were little shops with handmade crafts to visit and actives to explore, such as nighttime lit up river boat rides. Wuzhen was great because it allowed me to get away from all the hustle and bustle of the more touristy city places. P.S. If you are close enough to Shanghai, stay the night there and wander a little. The lights in New York are no comparison! We are so excited for you guys to come! When are you coming? You’d love the Great Wall! We went to the Terra Cotta Warriors in Xi’an- That was pretty cool, but I don’t think you would want to spend more than one day there. Can’t wait to see you! China is a blast and there are so many places to explore. The last time I was there was several years befor the Olympics so I am sure things are very different now. Definitely do the standard stops in Beijing such as the Great Wall, Imperial Palace, Tianaman Square. I would also recommend visiting Nanjing, the former capital of China. It’s not a big tourist destination which makes it a lot more special than Beijing. There is a lot of personality and insights to what China was like during the Imperial Times. Also if you do get a chance visit Xian, where the Terra Cotta warriors are located. In that area you can find shops that sell replicas of the soldiers or better yet glazed tiles done in the style of the warriors. We have a six piece tile of the horse spirits in our kitchen. Guilin is also amazing. It is an area of natural beauty. In the traditional Chinese paintings of high mountain cliffs and snaking rivers below, the inspiration is from this area. It’s really amazing. Go to Shanghai and eat as much xiao long baos (soup dumplings) as possible. There is a famous restaurant outside of a famous garden in Shanghai which is always packed. It is well worth the wait. Sorry I can’t be more specific with names, as it has been over five years since I’ve been there. I would recommend getting a copy of Lonely Planet China. We got a lof of our recommendations from the book. Jiuzhaigou and Huanglong in Sichuan Province and Huangshan in Anhui. Gorgeous. The former French Concession in Shanghai is not to be missed. If you like to walk, the Six Shanghai Walks and Six More Shanghai Walk books are great source (http://www.tessinshanghai.com/books.html) or follow Tess in one of her tours. I travel to China two years ago and I wrote a post about that I think you might find helpful! My favourite memory from a family trip was seeing the terra cotta soldiers in Xi’an. I thought it was amazing how every little boy probably dreams of building his own army with thousands of life-sized warriors, each one with its own features, expressions, and weapons; but only one boy (the emporor!) would ever have the power to make it happen. Afterwards, we rented bikes and rode along the top of the wall that surrounds the site during sunset. So fun if you get the chance to do it! You and your family are going to China! That’s so exciting! I lived in China for four and half years! There’s so much to do in China and so many places to see. If you’re in Shanghai there are many places to go. There is this great Artsy district with awesome shops and restaurants. TianZiFang 田子坊 It’s kind of hard to find (or at least it was for me) but the cabbies should know about it. Once you find it, you’ll wanna stay there all day. I went there with my folks! I loved it! I wish I could have stayed longer. The Nanjing Walking Street in Shanghai is always a sight to see as well. The food in Shanghai is great too! It’s more so on the sweet side! I love it! If you go to China, you have to go to Beijing. The Great Wall is a must! Make sure the weather is nice, like no rain and you’ll definitely get gorgeous pictures. I sang and recorded “I’ll Make a Man Outta You” on the Great Wall in honor of Mulan! It was the coolest thing ever! Haha! There’s the Forbidden City and the Summer Palace. The Temple of Heaven is gorgeous! Qianmen Street is a great pedestrian street! It’s got traditional buildings with modern stores like Starbucks and Sephora. It’s really a sight to see. There is also a hostel there called 365 Inn that is great. The rooms are fantastic and there is restaurant connected to it. But they get fully booked pretty fast so its best to book in advance. Sanlitun 三里屯 is in the Chaoyang District in Beijing and there are a lot of great shops and restaurants there. There is a place there called The Lollipop Bakery that sells great cupcakes in case you or your family misses home. The owners are from London I believe. There is also an awesome bar street there that caters to foreigners. I had a blast when I went there with my friends. I stayed in Wuhan, which is in Central China. It was a great experience because the city was being developed as I was there. I saw buildings rise up and watched the city transform. It was pretty awesome. Xi’An is a great city to visit as well. That’s where you can see the Terracotta Warriors. There is th Giant Wild Goose Pagoda there. It’s gorgeous. They also have their old city walls in the middle of the city. You can rent bikes and ride around the walls. It is so much fun! I had such a great time with my friends while riding around the on the walls. I hear Guilin is beautiful. I never got the chance to go but my friends went and they said they loved it. I didn’t spend much time in GuangZhou but I did spend some time in Hong Kong (which is right by GuangZhou) and it is phenomenal! There is so much to do there and the weather there is pretty great! You can go to Victoria’s Peak, ride the tram and you get to see the entire city. It’s gorgeous at night. The food there is out of this world! Chinese food in America wont be the same once you’ve eaten food in China. There’s also a Disneyland in Hong Kong. I never got the chance to go but when I go back I will! Sorry this is such a loooooong comment but I get so excited when I hear about people going to China. I hope you and your family have a fantastic time! I went once when I was younger, and loved seeing the Shanghai Temple and learning about the history surrounding it, the monks, and the kung-fu culture! Hi! My husband and I are from Las Vegas and we recently moved to China for 6 months to work. We first visited Beijing for two weeks and it was a blast. Like a few other people have mentioned, I’d recommend entering from the Mutianyu entrance; the toboggan slide on the way down was dirt cheap and one of the best parts about the Great Wall (besides the actual wall itself). We now live in Suzhou and it’s fantastic. It’s known as the “Venice of China” because there are canals left and right. It’s only a 25 minute train ride away from Shanghai, too! PingJian Lu Canal street is a MUST SEE in Suzhou with a ton of little boutique shops and interesting cafes (our favorite is the “cat cafe”). You can get everywhere and anywhere by train and it’s so cheap. Seriously, email me if you have questions on how to travel through China or the subway system in Suzhou if you do end up going there! When are you going?! I’m not sure where you’re planning to go in China. But my husband and I loved Xi’an – amazing Muslim markets, you can bike around the city wall, and the food is fantastic. Bejing is, of course, wonderful. 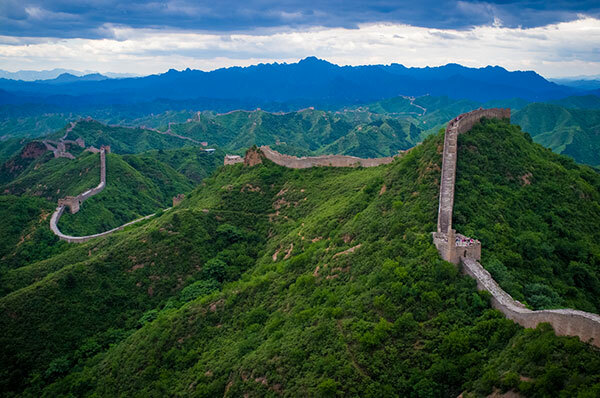 The Great Wall, the Hidden Palace, and all the other classic tourist things are definitely worth doing. However, really my favorite parts of the trip were when we were jet lagged so we were waking up at 6am, and we’d just walk around the markets and wander. Where ever you go, and whatever you do, you’ll have an amazing time. Also, eat street food (you’ll probably get sick, but it’s worth it). Hi, I am Monique, from the Netherlands and living in Beijing for 7 years now. China is a huge country so you can only see some of the beautiful places here. If you come to Beijing you should not miss the Great Wall, with children the part at Mutianyu is great because there is atobogan slide. Forbidden City and Tiananmen Square are also not to miss. But take your time, make sure you walk around the old city area’s the hutongs or go on a bicycle. Excellent source of information. Thank you!!!! – avoid famous mountain walking, if you don’t want to just walk on paved paths full of people. On Chinese mountains you rarely feel like “into the wild”. A very nice place to go (few few people, very original experience) is Dehang. – try the train too, sharing a long travel with chinese people is an amazing experience – it’s a very good occasion to speak with someone and to discover their “bad & funny” habits. – meet pandas! Even if it’s such a touristy experience, don’t miss it! – Beijing is the most exciting city I’ve never been. You will be surprise by people teaching dances, games, tai-chi in the parks: everybody want to share it with you! Chinese people in China is very welcoming and never annoying. – Last: in Beijing go to XP club, it’s a little bar where very talented rock groups play. it’s in italian, but you can see our photos and get inspiration!